Our Goose Coquilles are strung and sized 3-4". 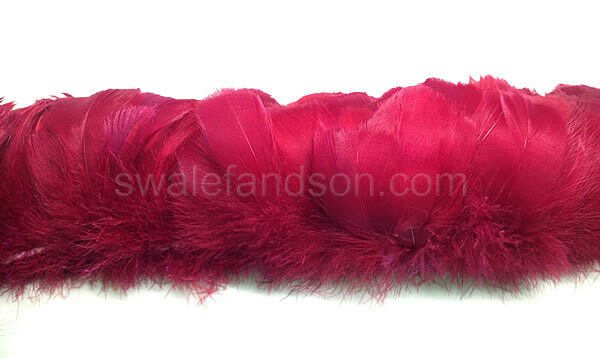 They are sold in half pound increments and there are about 4 yards of strung feathers in a half pound. Each half pound contains roughly 2,800 feathers. Goose Coquilles are most commonly used to make traditional Hawaiian Feather Leis. Though we have many colors to choose from, there are 8 colors that are most commonly used to represent each of the Hawaiian Islands. Magnificent Maui became the pink island, an easy decision because of the pink Damask rose found just about everywhere. Brought over from Asia in the 1800s, the Maui rose or lokelani, as it’s sometimes called, became the official flower in 1923. It is the only flower not officially recognized in 2000, and the only nonnative species selected. Boldly pink and fragrantly scented, the Maui rose proudly represents the pink island.